Few people become a legend in their own lifetime. Douglas Bader was one such person. An exceptional pilot and leader. At the age of 21, as a young RAF officer, he had both legs amputated after he crashed his aircraft. Through sheer guts and determination he learnt not only to walk again, but also fly, subsequently becoming the RAF’s most famous WW2 fighter pilot. 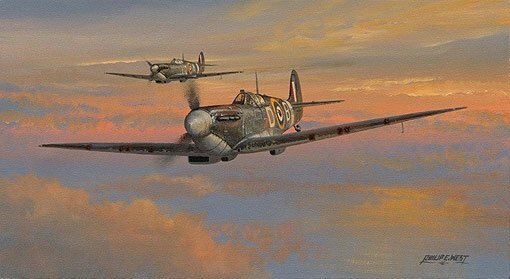 Flying his Spitfire with the unmistakable DB markings, Wing Commander Bader with his wingman close by, heads home to Tangmere after another successful, action-packed day, taking on swarms of enemy aircraft intent on wreaking havoc over the south of England. Flight Lieutenant Richard Jones began operational flying in 1940 with 64 Squadron flying Spitfires out of Kenley airfield, Surrey, from where he was in action during the Battle of Britain. When 64 Squadron was withdrawn from the front line Richard joined No 19 Squadron based at Fowlmere, part of the Duxford Sector. 19 Squadron was part of “The Big Wing”, led by Douglas Bader, the legendary legless fighter pilot. Sqn. Ldr. Percival H. Beake DFC, AE joined the RAFVR at Bristol in April 1939. Flying from Whitchurch Airfield on some evenings and weekends he had completed 50 hours training on Tiger Moths when war was declared. However, the mobilisation of all aircrew in Volunteer Reserve and Auxiliary Units overwhelmed the flying training facilities available and he was posted to No. 3 Initial Training Wing at St. Leonards on Sea where keep fit exercises and ground studies were the order of the day. Sqn. Ldr. Douglas Tidy was born in 1023. Claiming to be 18 in early 1940 he joined the RAF. Defective eyesight that was discovered (despite charts learned and ‘magic white powder’) ended his career as a tyro pilot and by the summer of 1941 he was in he Operations Room at Portreath in Cornwall, happily still with Spitfires, those of 66 and 130 Squadrons.